The discharging time is a dead time in the productive cycle, so the faster is the opening the greater are the savings. 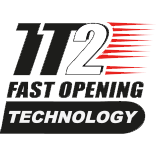 TT2 Fast is the fastest opening system in the market. 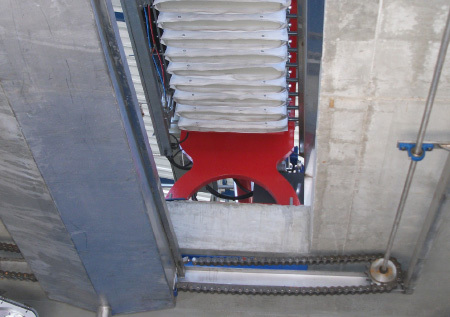 This system is installed on filterpresses with more than 50 plates and can discharge the cakes for 100 plates in less than 2 minutes and for 200 plates in less than 4 minutes. It basically works through one steel bar per side which is moved by dedicated oledynamic pistons which start pulling to open the plate pack. On the TT bar there is another piston whose purpose is to lift the metal dog which wedges in the special TT handle of the plate. The anti-crossing system prevents any possible damage that may be caused by the non-perfect alignment of the plates. 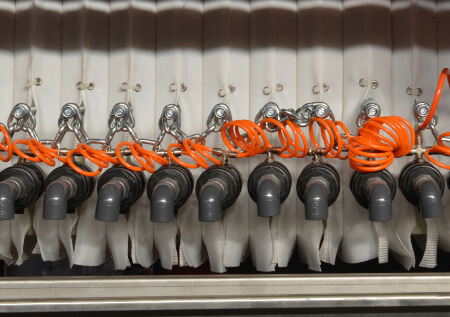 Through the Gasser Shaker system, Matec can guarantee the perfect discharging of cakes from the plates. It shakes the plates automatically, in order to avoid that some mud is still attached to the plates. That would be very dangerous for the machine and may cause the breaking of plates during the next filtration process, when the piston closes the filter pack. 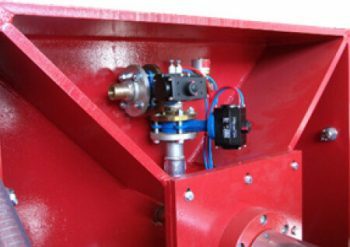 The Gasser Shaker system guarantees also low power consumption, because the pistons that shake the plates are pneumatic ones. The filter press can be equipped with an automatic washing system for plates and cloths. The system is composed by one valve and one system of pipes on the mud head side of the filter press, and discharging valves on every single plate. The feeding pump sends clean water to wash the residual mud. The system washes the plates 20 by 20. The frequency of the washing cycle is set through the operator panel. The core blow system is a system conceived to clean out the central feeding residual liquid mud which remains in the diffusion conduit through the plates. The blowing occurs when the filtration cycle has ended, but before the cake discharging. One dedicated valve system allows the blown mud to bypass the mud feeding pump and to be discharged in the mud homogenizer tank again. The cake dryer system is installed to lower the residual moisture of the cakes by injecting air into the filter press. The air dries the cakes and is discharged through the drainage system. The Drip Tray System is a system conceived to prevent the dripping of water on the already discharged mud cakes. It works automatically and it is controlled by the PLC and moved by a dedicated motor / gearbox system. The tray is placed under the filter press during the filtration cycle and it shifts away when the filter press opens for the cakes’ discharging. A close circuit system for special mud with chemicals. It usually works together with the membrane plate system, allowing a clean water flow inside the plate chambers before cakes are discharged. This process rinses the cakes, to lower chemicals’ level under the “special mud” threshold.